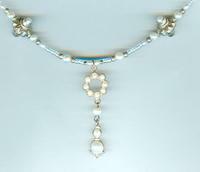 They show to advantage against the background of pale grey seed beads and round sterling silver beads. 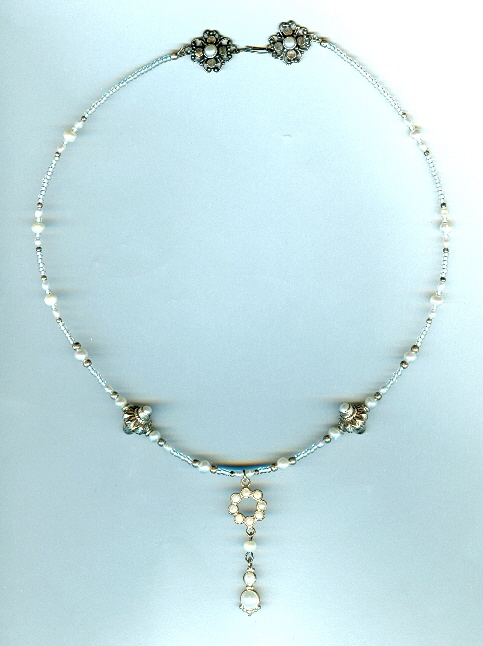 The 18 inch strand also features a pair of ornate sterling silver beads set with pearls on two sides, and a pearl-set sterling silver hook-set clasp. The pendant -- which drops about 2 inches below the strand -- features a sterling silver link set with eight tiny freshwater pearls, and a sterling silver drop set with a 4mm and a 7mm pearl. This delicate beauty is perfect for a young girl, but who's to say an older girl wouldn't like it, too? 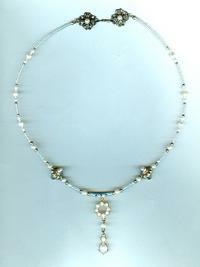 The sterling silver and blister pearl pendant's asymmetry is strangely appealing.